At the Lobero Theatre, Tuesday, August 7. 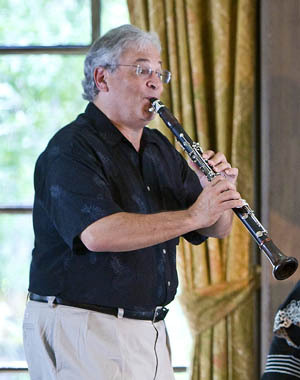 Clarinetist David Shifrin, shown here teaching a masterclass, played in all the ensembles that performed on August 7 at the Music Academy's Tuesdays at 8. The Music Academy of the West loves its alumni, and that love was amply requited last Tuesday as one of its most distinguished alums, clarinetist David Shifrin, appeared in all four pieces on a program that could have easily been titled “con amore”-with love. The Italian phrase was used by the composer of the program’s first work, Amilcare Ponchielli, to describe how he felt about the original players. It’s an unusual configuration-two clarinets and piano-that heightens the sense of spiritual connection and playful interplay possible among musicians whom play the same instrument. Shifrin was joined for the Ponchielli by Margaret McDonald on piano and by Fred Ormand, a distinguished musician whom Shifrin revealed to be his former high school clarinet teacher. Jonathan Feldman took over the piano seat for the next work on the program, Brahms’s Sonata in E-flat Major for Clarinet and Piano, Op. 120, No. 2 (1895). This is late Brahms, and among the most absorbing and deeply beautiful music of any kind ever composed. Shifrin and Feldman got every ounce of interest, meaning, and passion out of the score, and audience members were visibly moved by their performance of it. The two callbacks were one way to tell how well received this piece was, but the many stunned and dreamy expressions on people’s faces as they reluctantly left their seats for the intermission were, in their own way, just as telling. A consistent feature of this summer’s Tuesdays at 8 series has been the practice of playing chamber arrangements of longer orchestral works. It’s a great educational tool, and the piece that opened the second half of this concert-Franz Hasenhrl’s 15-minute Till Eulenspiegel Einmal Anders!-took the orchestral work of Richard Strauss’s Till Eulenspiegel in “another way” that definitely merited the exclamation point. The evening’s final performance was of the Quintet for Clarinet and Strings in A Major, K. 581 (1789) by Wolfgang Amadeus Mozart. Shifrin was joined by Kathleen Winkler, violin; Peter Salaff, violin; Donald McInnes, viola; and David Geber, cello for this almost impossibly rich and alluring work, which said so much in just 35 short minutes. Shifrin’s tone and command of the clarinet’s full range brought Mozart’s music fully alive, creating an experience as thrilling as it was profoundly consoling.